Dolphin lovers should not miss the unique opportunity to be a trainer for a day at Cabo Dolphins. This tour opportunity allows participants to go beyond swimming with dolphins and become part of our dolphin expert team. In this fun and unforgettable program, you'll learn all about dolphins with a behind-the-scenes view. Cabo Dolphins provides a unique and memorable opportunity for those with a true interest in dolphins: the opportunity to serve as a dolphin trainer for a day. This program takes you behind the scenes with our resident dolphins and our dolphin experts; you will learn about these intelligent marine mammals, participate in dolphin care, and have fun getting up close and personal with these amazing animals. When you join the Trainer for a Day tour, you will become part of our team. 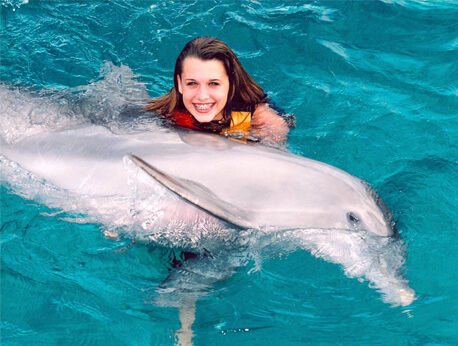 You will not only have the chance to swim with dolphins, but also to work with our professional expert staff and assist them in all aspects of their work. You'll even help our experts run the Swim with Dolphins program. This tour, with its behind-the-scenes view and hands-on experience in dolphin care, will give you an inside look at a career with dolphins. Participants will learn the feeding and behavioral training techniques used with the Pacific bottlenose dolphins resident at the Cabo Dolphins Center. The Trainer for a Day program is designed for true dolphin lovers and enthusiasts who want a real experience of a full-time career with dolphins. The program could spark a new desire to study marine biology and assist you or your child in becoming one of the professionals who has the opportunity to do this work on a daily basis. For those who already aspire to a career as a marine mammal professional, this is an unforgettable travel experience that cannot be missed. For those who want to live the dream for a day, this is your chance to immerse yourself in dolphin life. The tour is physically easy to handle and not strenuous, but because the program involves working directly with the dolphins, this program is only open to participants 12 years of age or older.